The wrong trousers? Common folk in striped clothes as readers of early modern recipes. When trying to make historical sense of printed medical recipe collections, one tricky but important question always recurs: who did the author and/or publisher think would be likely to read and benefit from their books? 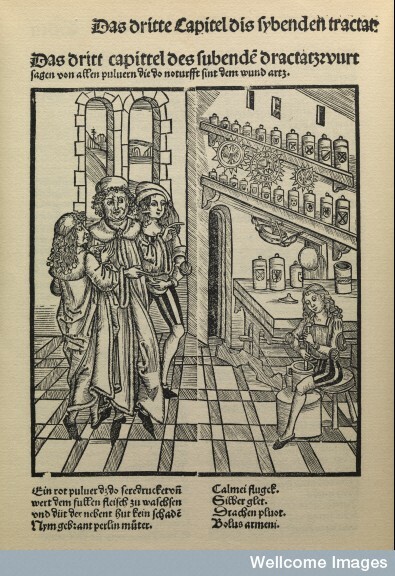 In my own research, which focuses on the works of the surgeon-apothecary Hieronymus Brunschwig (introduced here and here), this question is particularly intriguing because these books were among the first medical books to be printed in German. Of course, like many authors of the time, Brunschwig gives us some clues in the text of his works. He often addresses his instructions, especially medical recipes, to the ‘common man’ or the ‘layman’ who might not be able to afford certain remedies, or who might simply live too far away from the next larger town with a pharmacy shop. 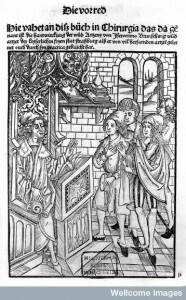 In addition to these textual hints, I want to take a different approach to the question of readers by making use of the numerous woodcuts illustrating Brunschwig’s works. Commissioned from an unknown artist by Brunschwig’s publisher, Johann Grüninger, these images are a striking element of the books. One thing which immediately strikes the eye when looking at these images is the prevalence of people dressed in striped clothes. 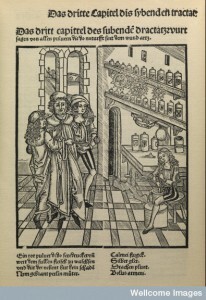 Take, for example, the title page of Brunschwig’s Small book of distillation, published in 1500. We see a group of people busily harvesting herbs and stoking furnaces to distill medicinal waters, and both of the men are dressed in conspicuously striped doublets and trousers. In fact, throughout Brunschwig’s works most of the people doing any kind of manual work are shown wearing stripes, for example the person pounding ingredients in an apothecary’s mortar shown below. 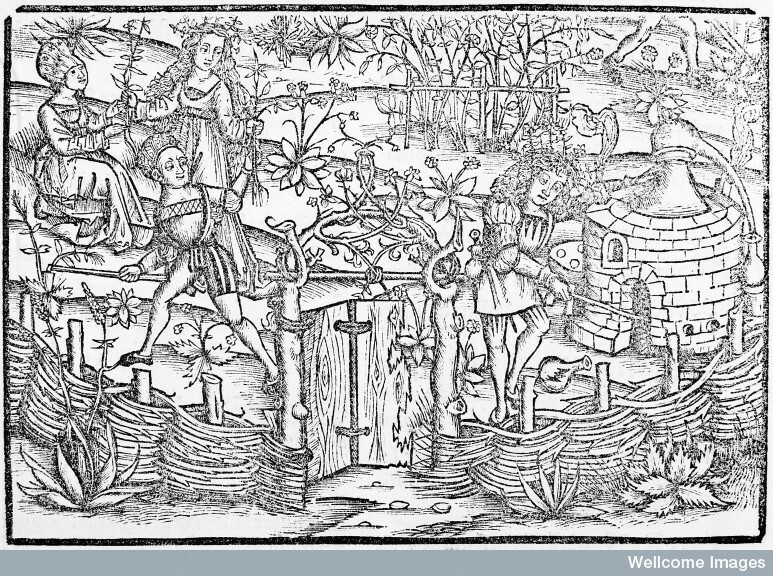 Surely, I thought, it must be significant that the majority of medicine-makers – Brunschwig’s ‘common men’ – are depicted in this manner. As it turns out, striped clothing had fairly wide-ranging connotations in the early-modern German lands. The fashion of tight-fitting, striped trousers had been brought to Germany from the Northern Italian courts by the new imperial infantry, the so-called lansquenets, towards the end of the fifteenth century. The striped fashion was particularly popular among the middling sort: citizens of free imperial towns, artisans, and even wealthy farmers and landowners. They constituted a growing and increasingly self-aware middle layer of society, sandwiched between poorer day-labourers who did not own any property, and the wealthy urban patriciate or landed gentry. Brunschwig’s works depict a similarly confident self-educated striped layman in the context of medicine. 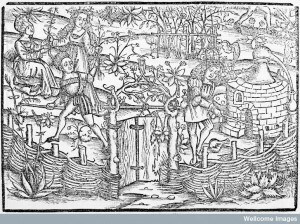 This is nicely summed up in the large woodcut above, which appears in all of Brunschwig’s works. 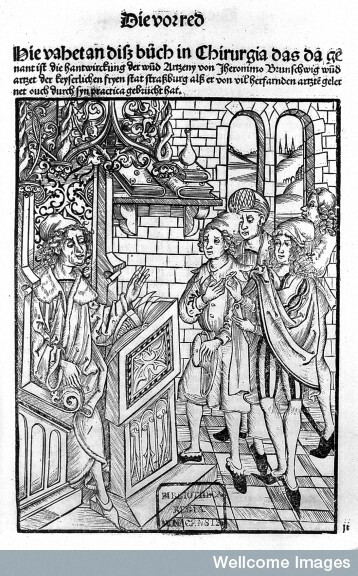 The teacher, identified by his fur-lined scholar’s robe and seated at a lectern, is lecturing from a large book. It is angled towards him, so that only he can see its contents, demonstrating the scholar’s authority over text-based learned medicine. Among his students, we see a young man dressed in stripes, and while his peers listen demurely with hat in hand, this striped chap is confidently gesticulating as if arguing a point of his own. What is more, he is holding a rolled-up piece of paper in one hand, perhaps a sheet of notes or even a medical recipe. While this striped layman does not command large tomes of medical learning, the picture suggests that he is literate and familiar with some of medicine’s written forms. He even appears capable of holding his own in a discussion with a scholar. The figure of the striped layman, with its connotations of middling status and education, is thus a very plausible visual cognate to Brunschwig’s readership of middling ‘common men.’ As if to vindicate this choice of intended audience and its visual representation, the physician Lorenz Fries, from the neighbouring town of Colmar, addressed his Mirror of Medicine (1518) specifically to ‘striped laypeople’ who want to learn about medicine – and published it with Grüninger in Strasbourg. 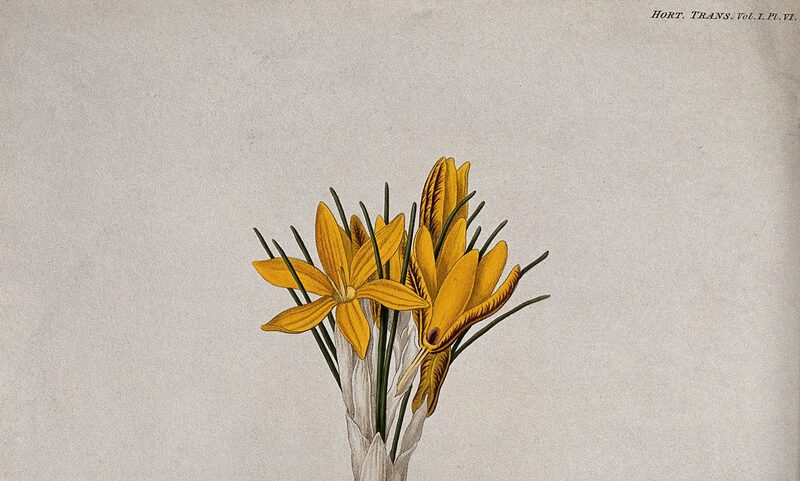 On the visual metaphor of the striped, see Schmid Blumer, Verena. Ikonographie und Sprachbild: Zur reformatorischen Flugschrift “Der gestryfft Schwitzer Baur”. Tübingen: Niemeyer, 2004.